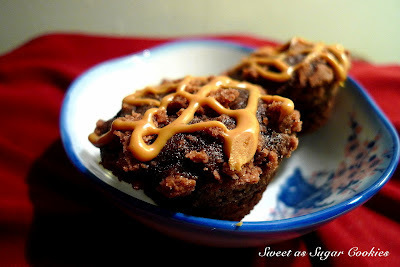 About a couple weeks ago, I finally got around to trying out a recipe for Peanut Butter Cookie Dough Topped Brownies. I enjoyed them so much that it got me to thinking. You all know about this thing I have for chai spice. 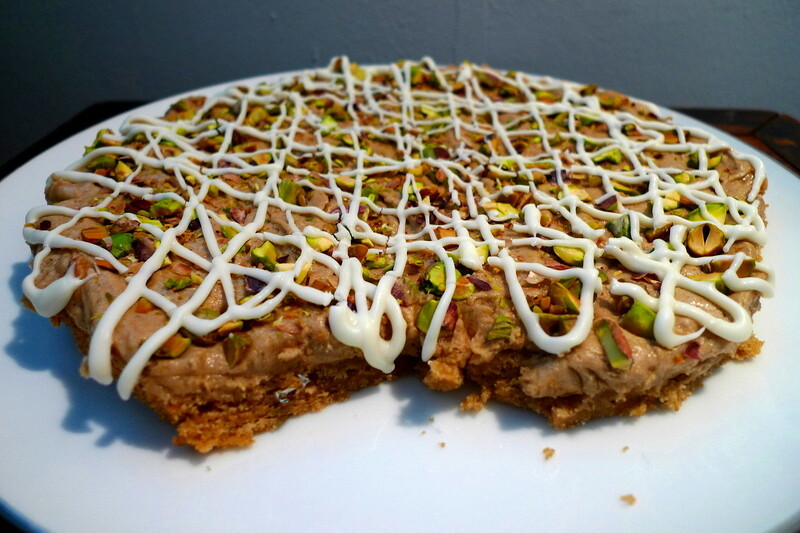 Well, I wondered, what about making a chai spiced version of those bars? To start with, I'd use a blondie base since brown sugar flavors and spice go together hand in hand. I used the recipe for Snickerdoodle Blondies from Sweet Pea's Kitchen and altered it slightly by omitting the nutmeg from the batter. 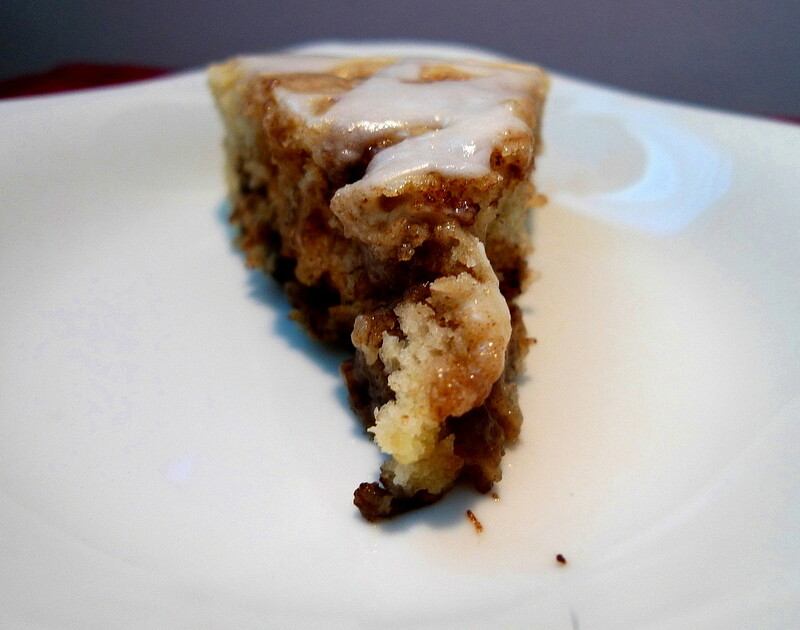 I also left off the cinnamon-sugar topping since I would be using the cookie dough on the blondies instead. 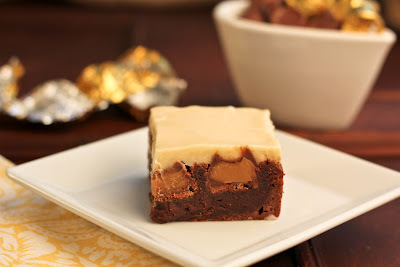 For the cookie dough topping, I turned to Brown Eyed Baker and altered the recipe she used for her Chocolate Chip Cookie Dough Topped Brownies. I used all brown sugar, decreased the vanilla, increased the flour, added my chai spice blend, and omitted the chocolate chips. After baking the blondie base and cooling it, I slathered on the cookie dough topping and finished it off with a melted white chocolate drizzle and some chopped pistachios. I was really pleased at how it turned out and how pretty it all looked. It also tasted quite good. But, there's always room for a little improvement. 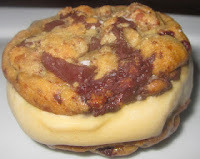 I think next time, I'd decrease the amount of sugar in the cookie dough topping. It was a little too sweet for me and reminded me more of buttercream frosting than cookie dough. Secondly, the cookie dough was a bit too soft for my taste, so I'd also decrease the amount of milk. 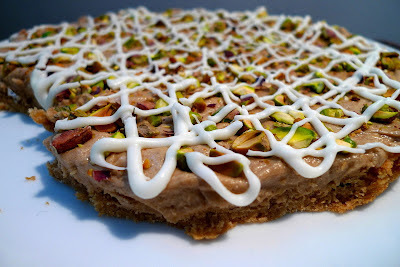 Finally, when making the blondie base, I'd probably increase the recipe by half (just to give me a thicker bar for my base) and add more chopped pistachios to it for texture and flavor. Still, though, for a first try, it was yummy indeed. And, after I tweak it up, I have a feeling it's gonna be amazing. Preheat oven to 350F. Line a 9x13 inch pan with foil, with an overhang on all four sides. Butter the foil. Cream the butter with the sugar. Add the egg and vanilla and beat well. Add the dry ingredients and stir to combine. Spread the batter evenly in the pan and bake 25-35 min. until a toothpick comes out clean. Let cool completely or chill in the fridge to speed up the process. For the cookie dough layer: Cream the butter and the sugar. Add the milk and vanilla and mix until combined. Mix in the flour and chai spice until just combined. Spread the cookie dough over the cooled blondies. 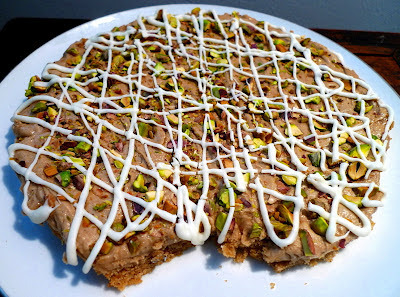 Sprinkle with the chopped pistachios. Drizzle with the melted white chocolate. Chill until the dough is firm, about 1 hour. Can I get like a dozen of these???!!! Like I said, when it comes to Muddy Budd-ifying stuff, the possibilities are endless. 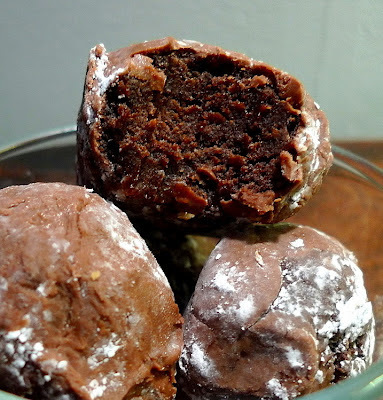 So, when I made these chocolate cake balls the other day, I just knew that some of them were destined to be Muddy Budd-ied. And, believe me, they do not disappoint. It is chocolate peanut butter nirvana. 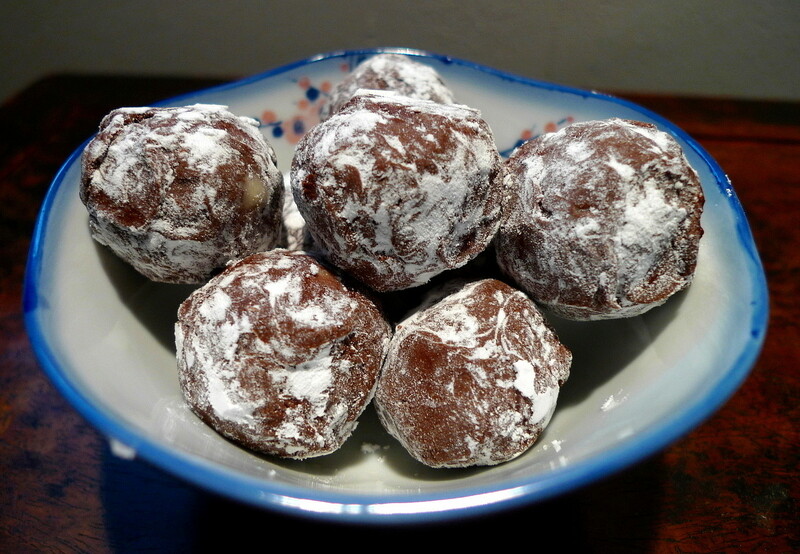 Put some powdered sugar into a bowl and set aside. Melt the chocolate chips with the peanut butter in a double boiler or in the microwave and stir to combine. Dip the cake balls in the muddy buddy mixture and coat with the powdered sugar. Let sit on a sheet of waxed paper to let the chocolate set. Alternately, you can chill them in the fridge (which I'd recommend). Wanna know a secret? Shhh, don't tell anyone. I actually ruined this cake. 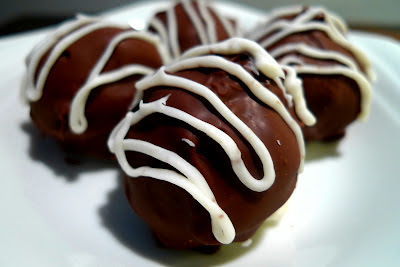 But, you'd never know it by looking at these lovely cake balls now would you? See, I had intended to make a beautiful two-layered chocolate cake using the recipe for Hershey's Perfectly Chocolate Chocolate Cake. I could see it all in my mind. 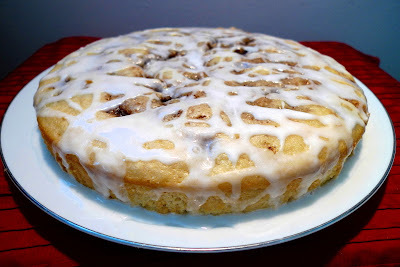 It would be frosted with a white buttercream and I would use melted chocolate to make a spiderweb pattern on the top. Oh yeah, it was going to be stunning. Except, that I messed up on the cake itself. I knew I should have used parchment paper in the pans. But, I rationed that it would all be alright and they would come out right as rain. I was wrong. They stuck to the pans leaving me with half a cake here and half a cake there, here a cake, there a cake, everywhere a cake, cake. I still figured that I could somehow glue it back together with the buttercream. Did I also mention I had them cooling on plates since I don't have actual cooling racks? So, they stuck some more and broke apart some more and looked like they had been hit by an earthquake. I had to admit that no amount of buttercream was going to remedy this. Onto Plans B, C, and D. I could make another cake in a 9x13 pan and that would work. But, then what am I supposed to do with THIS cake? After all, the cake itself was absolutely delicious (super chocolatey and moist) and it seemed such a shame to waste it. Well, I could crumble the cake up and make this Chocolate Trifle. That's it, a trifle. But, then I'd have to go out and buy more ingredients, a cost that I did not plan for and would rather avoid. 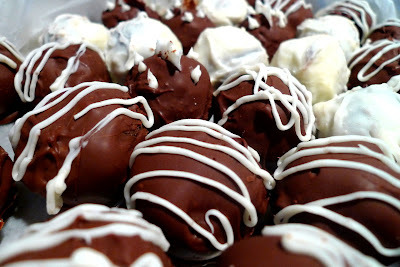 That only left one solution - cake balls! I made several different types - white chocolate covered, mint chocolate covered, and another one that I'll share tomorrow (one hint - it's my specialty). They were fairly easy to make, though I did learn some things along the way. One - if you made a dark colored cake, use a dark colored coating, especially if you're the type that stresses like me when you can clearly see the cake peeking through. 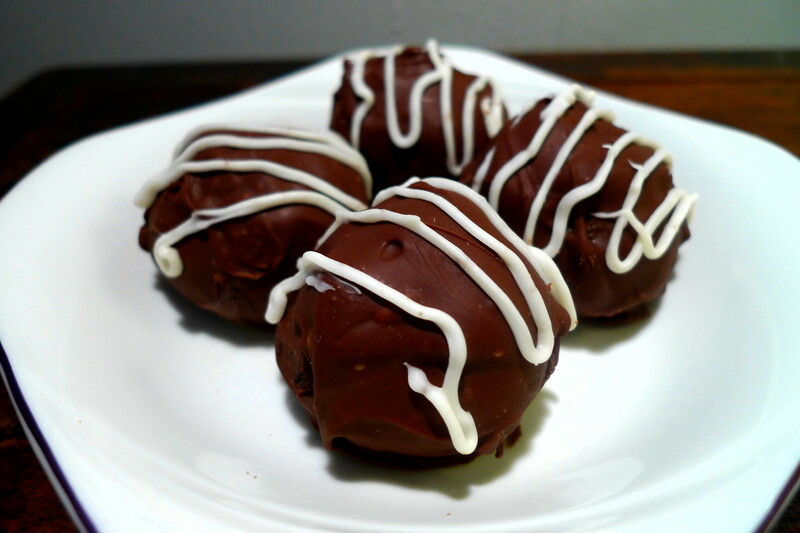 Two - using melted chocolate chips is a lot easier than candy melts. Somehow, the candy melts just didn't work as well for me. As you can see from the picture (the white ones), they came out kind of fraggly. 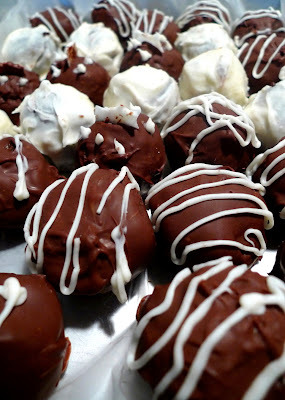 Three - before you dip, freeze those cake balls! Believe me, I speak from experience. It'll save you a world of mess and fuss. 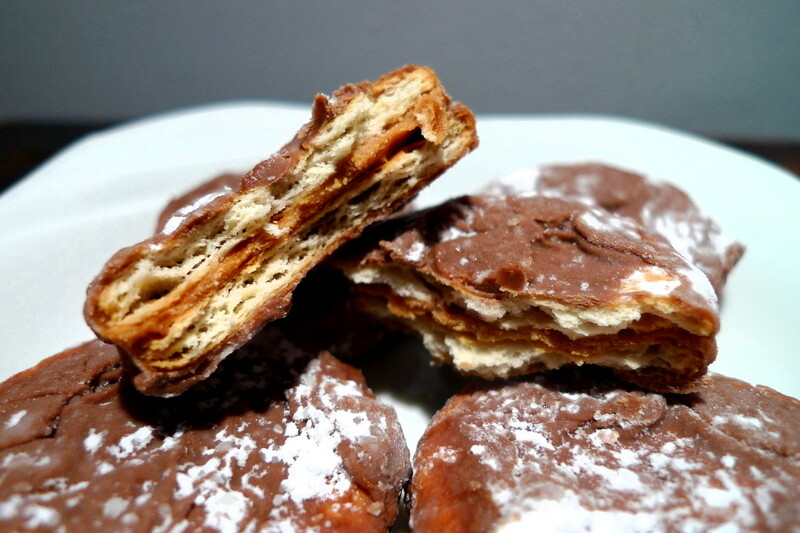 Other than that, they are totally easy to make and I think they're even better than a cake. They say when life gives you lemons, make lemonade. I say, when life gives you a ruined cake, make cake balls! Heat oven to 350F. Grease and flour two 9" inch found baking pans or a 9x13 cake pan. Stir together the dry ingredients in a large bowl. Combine the wet ingredients (except for the boiling water) and add. Beat on medium speed for 2 minutes. Stir in the boiling water. Pour batter into the pans. Bake 30-35 min. or until a toothpick comes out clean. Cool 10 min. before removing from pans. 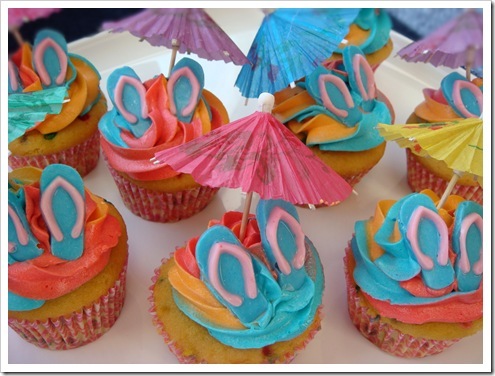 Let cakes cool on a wire rack. Beat the butter with the sugar. Add the milk a little at a time until you have the consistency you want. Line a cookie sheet with waxed paper. Crumble up the cake and mix it with your frosting. 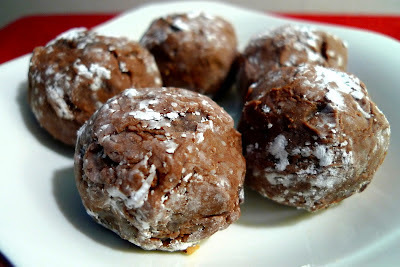 Form the mixture into balls, lay them out on the cookie sheet, and freeze until firm. 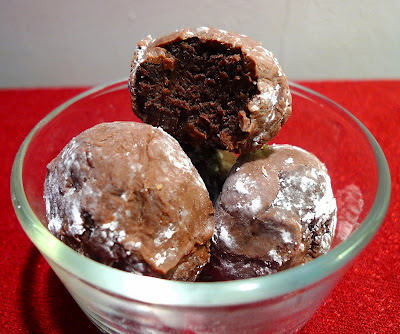 Melt the candy melts or chocolate chips in a double boiler or in the microwave. 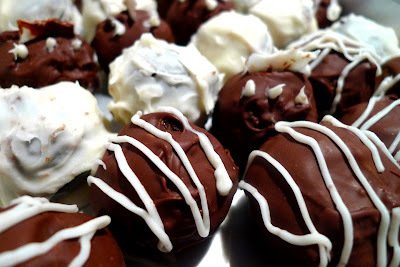 Dip the cake balls into the melted chocolate and lay out on the waxed paper to let the chocolate set. Chill in the fridge for the tastiest results. Yes, it's yet another Muddy Buddy treat - Muddy Buddy Ritz Peanut Butter Sandwiches. You didn't think I was done with them, did you? Not when there's so many delicious options to explore. This one, in particular, has got to be my absolute fave of the Muddy Buddy creations that I've made. Seriously, the Oreos were good, the Nutter Butters and Teddy Grahams were addicting, but these, ohhhhh these . . . nothing compares. I actually tried them two different ways - chilled and room temperature. The room temperature ones are good if you want all that creamy peanut butter to ooze out when you take a bite. But, I think I like them chilled best of all, there's just something about them when they're cold. I shared them with my "taste testers" and they were over the moon as they ate these. According to them, these are "the bomb." As for me, I couldn't agree more. Score! Put some powdered sugar in a bowl and set aside. 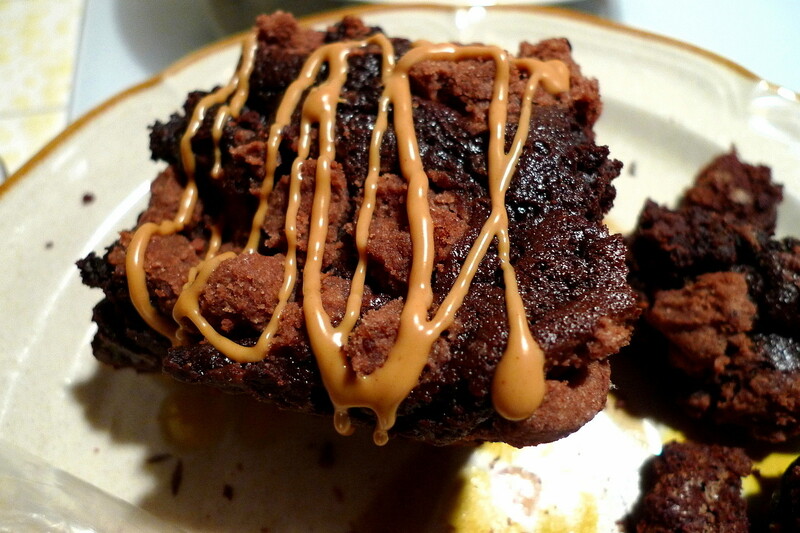 Melt the chocolate chips with the peanut butter and set aside. Spread about 1/2 tsp. of peanut butter onto half of the Ritz crackers and sandwich them with the rest of the crackers. 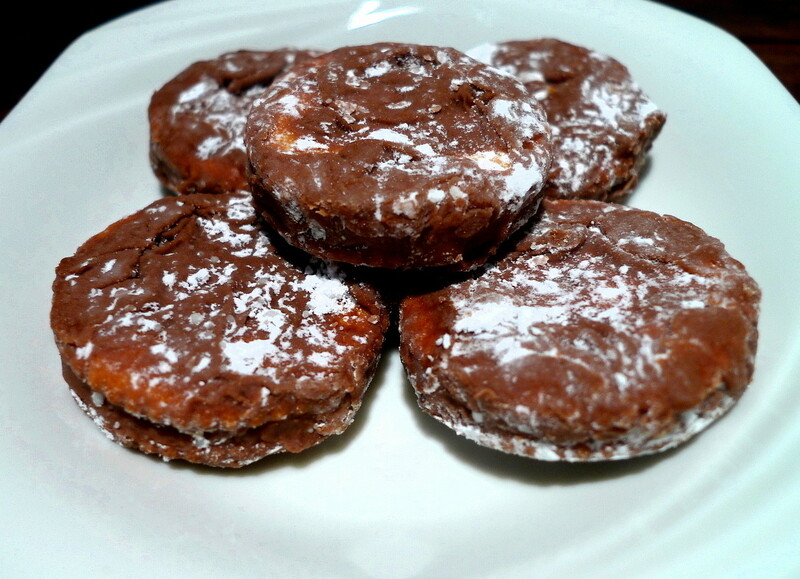 Dip the Ritz sandwiches in the chocolate-peanut butter mixture. Drop the sandwiches into the powdered sugar and coat. Let set on a piece of waxed paper to let the chocolate set. If desired, you can chill them in the fridge (which I highly recommend). Eating these would be wedded bliss for sure. Forget storebought - make these instead. Who needs a bakery when you can have these? Trying to decide between cannoli and cheesecake? Have both! "It's like . . . gravity moves. When you see [this cake], suddenly it's not the earth holding you here anymore. [This cake] does. And nothing matters more than [this cake]." Okay, maybe not really, but all those other recipes did fly out of my head. Plus, I had every single one of the ingredients to make it. If that's not a sign, I don't know what is. 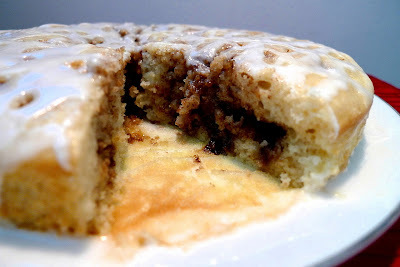 The only issue I ran into was with regards to the cinnamon-sugar-butter filling in this cake. 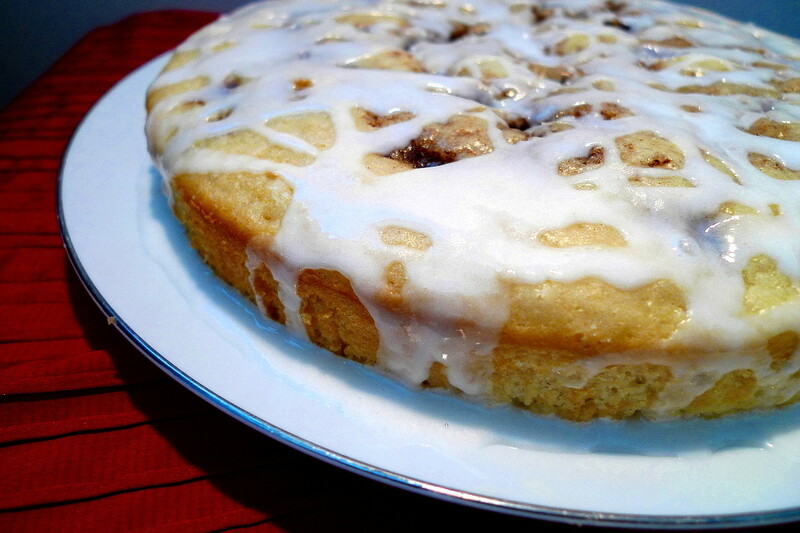 The recipe has you whip the butter with the sugar and cinnamon until it's light and fluffy. Then, you dollop it on and swirl it in. Whip it up - fine. Dollop it on - done. Swirl it in - "Houston, we have a problem." Usually, when I have to swirl something in, the thing that I'm swirling is the consistency of say, a cake batter. But, this was thick, more like a cake frosting. I grabbed my butterknife and just started to push and mix it into the cake batter a little here and there, breaking it up as I went along. I had no idea if I was doing it right, but I'd soon find out after it was baked. Turns out, it all worked out in the end. As the cake bakes, that buttery-sugary filling melts up, becomes gooey-er, and turns an ordinary cake into something totally extraordinary. As for the glaze on top, well, it's the icing on the cake, so to speak. It was truly delicious. I still intend to make those other recipes, but I'm very glad I bumped this one up in line. It was worth it. For the cake, preheat oven to 350F. Grease two 8" round cake pans, lining the bottom with parchment paper. Blend the flour, sugar, salt, baking powder, milk, eggs, vanilla, and 1/4 cup melted butter. Divide the batter evenly between the cake pans. Beat the 1 cup butter with brown sugar, 2 Tbsp. flour, and cinnamon. Continue to beat until fully blended and fluffy (about 3 min.). 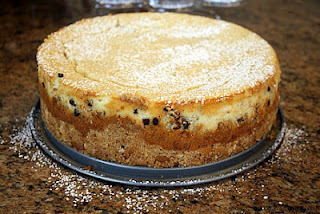 Using a tablespoon, drop butter mixture onto cake batter. Use a knife to swirl. Bake cakes for about 25-30 min. (my oven needed 40-45 min.). Remove from oven and cool in pans 10 min. Turn cakes out onto serving plates. For icing, whisk the powdered sugar with 1/4 cup milk (or more as needed for desired consistency) and vanilla. Drizzle over warmed cakes. 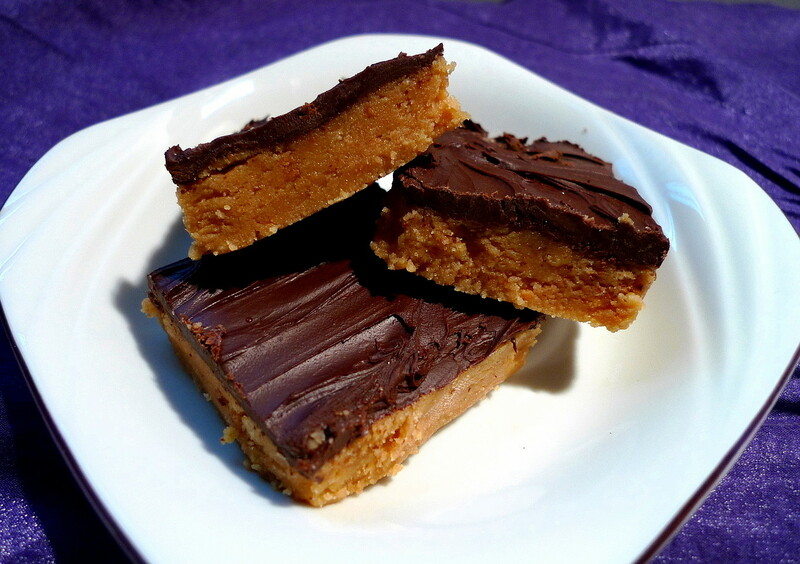 Last week, I made some No-Bake Peanut Butter Bars using Ritz Crackers. And, they were very good. But, let's say you wanted to share this yumminess with someone else. And, let's say that you wanted to present them in a way that would really impress. What do you do? You turn them into truffles. But, not just any truffles. If you've seen my Muddy Buddy Madness before, then you know what I had to do - Muddy Budd-ify them! That's right. 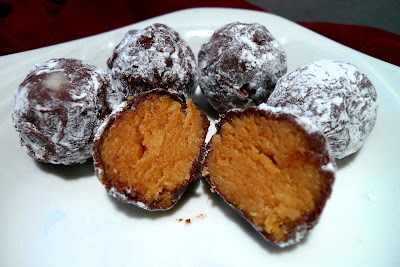 I formed that peanut buttery layer into little balls, dipped them in a mixture of chocolate and peanut butter, and dusted them with some powdered sugar. Sensational and super pretty! Oh, and of course, they're delicious. In a medium bowl, mix together the melted butter, graham cracker crumbs, confectioners’ sugar, and 1 cup peanut butter until well blended. Form the mixture into 1-inch balls and chill in the fridge for 30-60 min. Put some powdered sugar into a bowl. Melt the chocolate chips with the peanut butter in the microwave or a double boiler. Stir together to combine. Dip the balls in the chocolate-peanut butter mixture and drop them in the powdered sugar to coat (it's easiest if you just sort of shake the bowl to move the truffle around). Put the truffle in your hand and shake off the excess sugar. Let sit on some waxed paper to let the chocolate set. Amazing what a little soda can do. 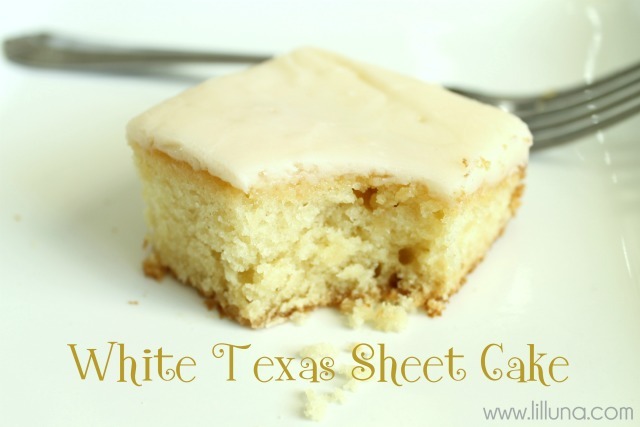 If you like white chocolate, this one is for YOU! Did you ever have a favorite candy growing up? For me, I loved Reeses' peanut butter cups. My way of eating them was to try and nibble off all the chocolate on the outside leaving the peanut buttery center for last. The thing is though, that candy these days is a lot more expensive. I mean, do I really want to pay $1.50 for TWO peanut butter cups? Um, no. So, I loved it when I found this recipe on Six Sisters' Stuff where you can make a whole batch of them for a whole lot cheaper. I'm in!!! My change to the recipe, though, was that I decided to use Ritz cracker crumbs instead of graham cracker crumbs. I'm not sure if the Ritz crackers made a difference, but they sure were good! They taste exactly like Reeses' peanut butter cups and that's saying something. No more buying them from the store for me. 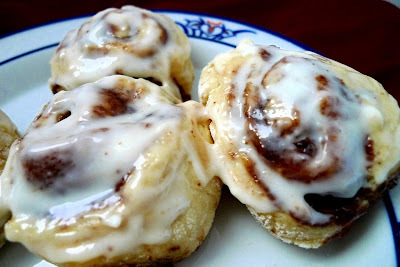 Give me a panful of these any day! 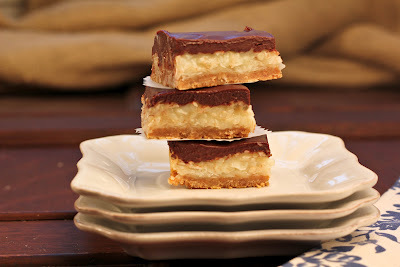 By the way, stay tuned for next week when I show you how I took these bars to a whole different level of yum. Mix together the melted butter, cracker crumbs, powdered sugar, and peanut butter until well blended. Press evenly into the bottom of an ungreased 9x13 pan (or a 9x9 inch pan for thicker bars). Melt the chocolate chips and spread over the peanut butter layer. Chill for 1 hour before cutting into squares. 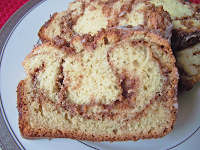 After making that crumb-topped Biscoff Cinnamon Swirl Bread last week, it got me to thinking about how great a CHOCOLATE crumb topped bread would be. I literally could not get the idea out of my head, so I had no choice but to run to the kitchen to try it out. I started with the Chocolate Loaf recipe from Baked Explorations. I've made it before and knew how amazing it was. Seriously, it is so dense and chocolatey that you'd swear you're eating a brownie. The only change I made to that recipe itself was to use melted butter in place of the oil. Then, I got creative. First, I made a mixture of melted chocolate and peanut butter. This would be the filling in between the layers of bread. In order to keep it liquidy and smooth, I put the bowl in another bowl of warm water. It works perfectly as long as you don't get any of the water into your chocolate-peanut butter mixture. Next, I created a chocolate crumb topping. It took a bit of tweaking and a lot of tasting to get it right. It had to be chocolatey enough, of course, and I also wanted it to be sweet enough, but not too sweet. Several yummy bites later, it was just right. If you're making this bread, you might want to make the crumb topping first so that it's ready to go when you start layering in the batter. You can put it in the fridge to keep it nice and cold until it's time to use it. Finally, it was time to put it all together. I used mini loaf pans and filled each one with about 1/3 cup of batter to start (any more batter will cause the pans to overflow and you'll lose all your lovely crumb topping). Then, I dolloped on a layer of the chocolate-peanut butter mixture (about 3 Tbsp.). It's your choice whether you want to swirl it in or not. I did one loaf both ways to see which way I liked better. Finally, I topped it off with another 1/3 cup of batter and cobblestoned the top with large chocolatey crumbs. The finished loaves were awesome! 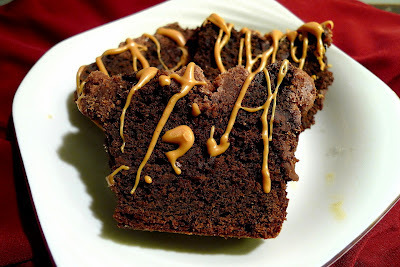 The chocolate bread was rich like a brownie and the chocolate-peanut butter filling was like a molten river running through it. As for the crumb topping? Well, who doesn't like crumb topping is all I can say. To finish it all off, I drizzled it with melted peanut butter. Decadent! I even had some batter left over (since I only made half a batch), so I made muffins with them. 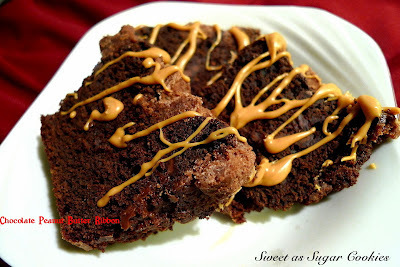 Chocolate and peanut butter for breakfast? Don't need to ask me twice. Enjoy! Combine the dry ingredients and whisk together well. Cut in the butter until you get pea-sized bits. Set in the fridge to chill until ready to use. 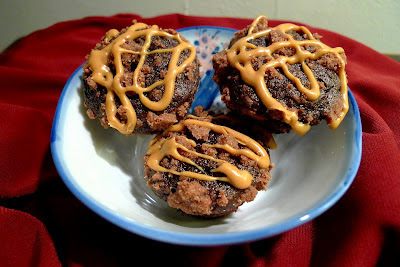 Melt the chocolate chips with the peanut butter in the microwave or in a double boiler and stir to combine. Set aside. Note: If you're worried about it solidifying before you're ready to use it, you can do what I did and put the bowl of chocolate-peanut butter into another bowl half filled with warm water (just don't let any water get into the chocolate mixture). Preheat the oven to 350F. Grease and flour five mini loaf pans. Combine the dry ingredients. Whisk the eggs with the egg yolk, then add the buttermilk, oil, and vanilla and whisk until combined. Add the wet ingredients to the dry ingredients mixing just until combined. Pour 1/3 cup of the batter into each loaf pan. Dollop 3 Tbsp. of the chocolate-peanut butter filling onto the batter and spread it as evenly as you can without mixing it into the batter itself. Spread 1/3 cup more of batter onto the filling and spread evenly. 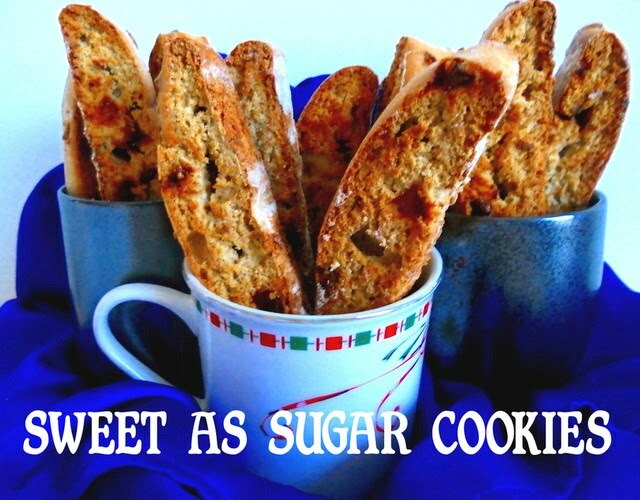 Take your crumb topping and squeeze it in your hand to form it into clumps. Pinch off pieces of the crumb topping (as big as you want) and make a layer of pieces on the top of the batter, covering the top completely. Bake for 45-60 min. or until a toothpick comes out clean. After removing it from the oven, let cool in the pans for at least 10 min., then put in the fridge to let the chocolate filling solidify a little (to make it easier to unmold). Or, if it doesn't bother you to have it fall apart a bit, go ahead and forgo the chilling and enjoy a piece while it's still warm and the chocolate inside is deliciously gooey. Grease and flour four mini muffin tins. Fill each with about a tablespoonful of batter. Top with some of the crumb topping. Bake at 350F for about 12-15 min. (or until a toothpick comes out clean). 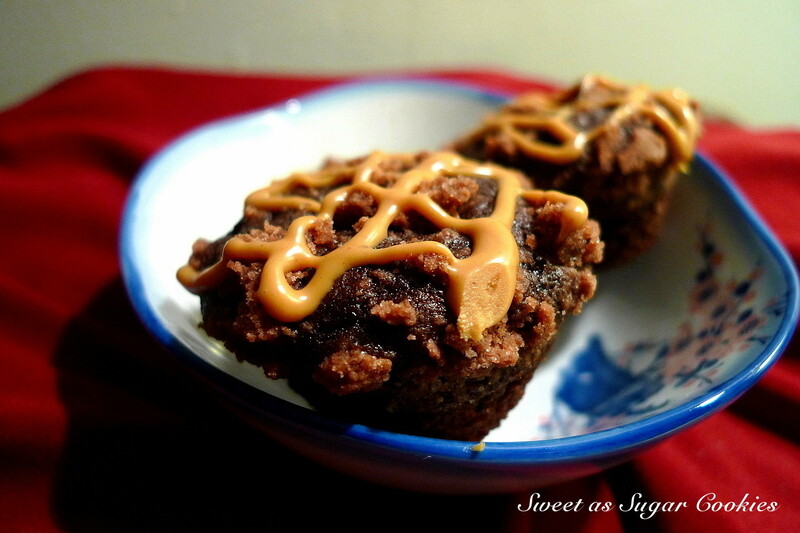 When cooled, drizzle with melted peanut butter. 1. If you want, you can swirl the chocolate-peanut butter mixture into the batter. Or, leave it as written and you'll have a nice ribbon of it running straight through the middle. 2. Chilling it after it has cooled a little might make it easier to unmold. 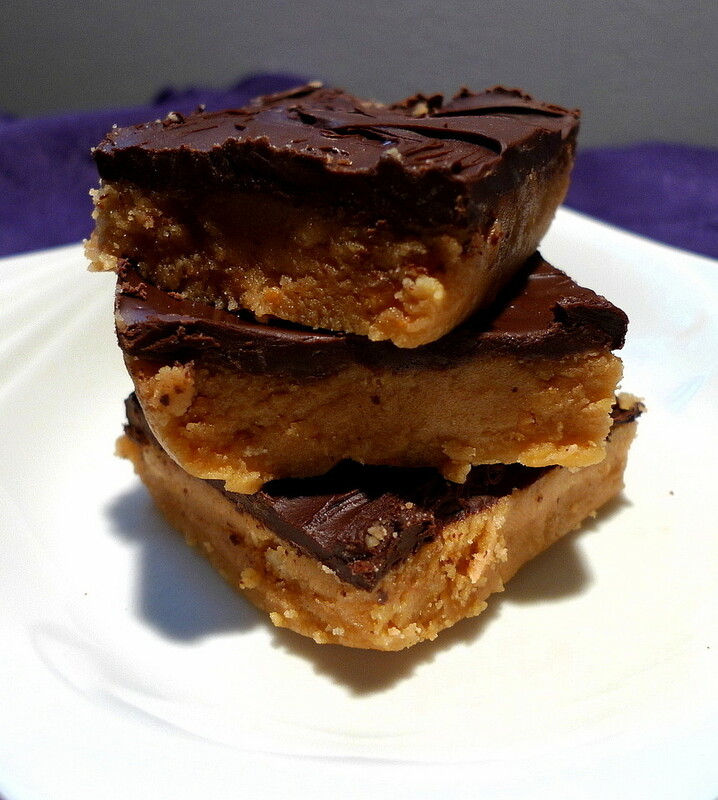 If you do chill it, the chocolate-peanut butter layer in the middle will solidify to become almost like fudge. If you choose not to chill it, it might break just a little, but you'll have the benefit of enjoying a nice melty, gooey layer of chocolatey-peanut buttery goodness. It's a win-win situation either way. It turns out that Allison, from the blog, Alli N' Son was orphaned during this month's Secret Recipe Club. So, I volunteered with another blogger to step in and make something from her blog as well and it worked out great. See, my family loves homemade cinnamon rolls. Don't get me wrong, I love them too. But, what I don't love is having to get up at 6am to start the process. Then, while the dough rises, I try to go back to sleep. But, because dough rises so fast in my warm kitchen, I only end up closing my eyes for 20 min. before I have to get back to work on it again. Meanwhile, my family is in sweet dreamland. So, when I saw this recipe for NO-RISE Chocolate Cinnamon Rolls on Allison's site, you can bet I jumped on it. The only thing I wondered was, can it really be done? I was about to find out. The dough is more like a biscuit dough since there's no yeast in it. I did run into a few mishaps trying to roll it out and then roll it up since it kept sticking to my surface no matter how much I floured it. 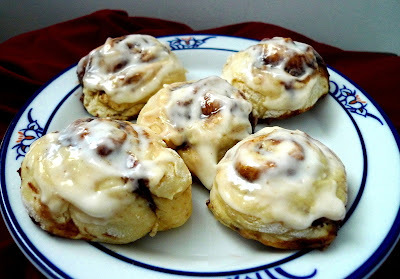 But, I soldiered on and soon I had some mini cinnamon rolls all ready to go in the oven. I'll admit, a few burst open while baking (my fault), but the rest came out beautifully. To my surprise, I actually liked the combo of chocolate and cinnamon in these rolls. The filling kind of reminded me of chocolate syrup (which is always a good thing) and the rolls were soft and melt in your mouth good. 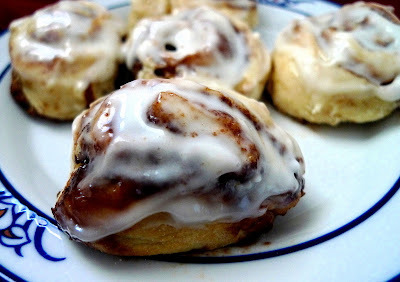 Will these replace my go-to cinnamon roll recipe? Probably not. But, if my family wants cinnamon rolls for breakfast and I want to sleep? You can bet I'm gonna make these. Allison gets double the love today because Andrea from the blog, Adventures in All Things Food, also stepped up and volunteered to help out. She made an amazing looking Pineapple Fried Rice. You're gonna want to reach into your computer screen and pull the plate out when you see it. Yum! For the filling: In a small bowl, combine the melted butter, sugars, cinnamon, and cocoa powder. Set aside. Preheat oven to 400F. Spray an 8" pan with non-stick spray. Combine the flour, sugar, baking soda, baking powder, and salt. Stir in the melted butter and buttermilk to form a soft dough. Turn the dough out onto a well-floured countertop and knead 8-10 times, adding flour if necessary (I had to add in about 1/4-1/2 cup more of flour). Using a floured rolling pin, roll the dough into a rectangle about 1/3" thick and 12 inches long. Evenly spread the cinnamon-chocolate mixture on the dough and sprinkle with the chocolate chips, if using. Starting with the long end, roll the dough up. Cut into 12 even slices (I used dental floss to cut them). Place cut side down on prepared pan. Bake for 20-25 min., until golden brown. Allow to cool slightly, then turn out onto a plate. While the rolls are cooling, combine the powdered sugar, milk, and cream cheese in a small bowl. Mix until smooth. Drizzle over warm cinnamon rolls. For this month's Secret Recipe Club, I was assigned to Jessie's blog, Vanderbilt Wife. After browsing through all her recipes, I knew exactly what I wanted to make - Fresh Strawberry Muffins. I am a strawberry fiend. Whenever it's strawberry season, I buy several pounds at a time and finish them off in just a few days. I could literally eat them every day and never get tired of them. And since it just happens to be that time of year, my fridge had several more pounds of strawberries just sitting in there all ready to be eaten. I suppose I could afford to part with some of them to make into delicious muffins. I ended up putting strawberries into some of them. Into others, I added some chocolate chips with the strawberries. 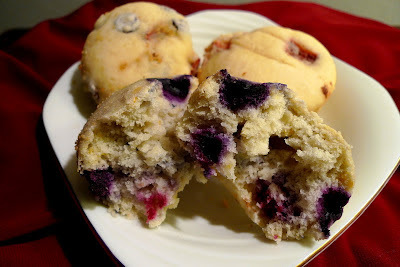 Then, I remembered that I had some blueberries and lemons, so I threw that into some of the muffins as well. While they were all delicious, I think the blueberry lemon ones were my absolute faves. There's just something about having a juicy berry explode in your mouth with every bite. At some point, I had considered glazing the muffins maybe with a lemon-powdered sugar glaze. But, upon eating them, I realized the muffins don't need it at all. They're totally yummy without it. Thanks Jessie for a super muffin recipe! If using the lemon zest, add it to the sugar and rub it in with your fingertips until the sugar is moist and fragrant. Cream butter and lemon-sugar. Add egg and mix well. Add flour, baking powder, and salt to a small bowl. Stir well with a wire whisk. Add flour mixture and milk alternately to butter mixture. Add vanilla. Gently stir in strawberries or blueberries or chocolate chips, or whatever you wish. 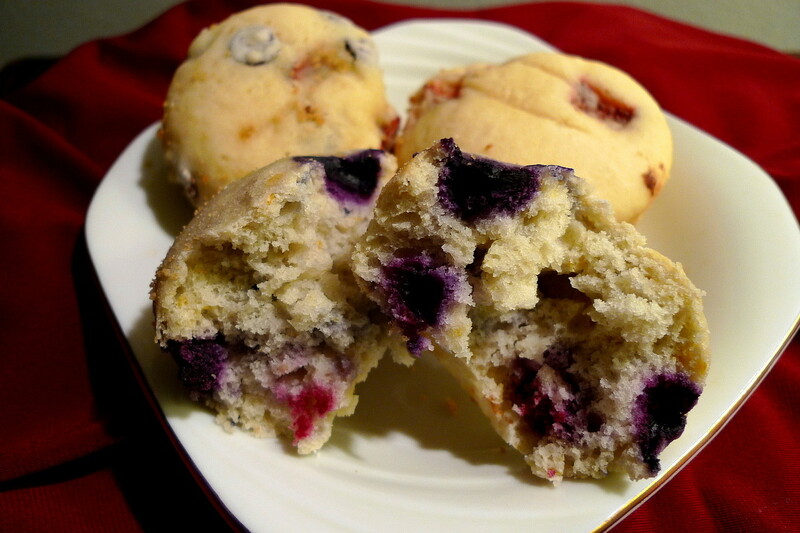 Spoon batter into muffin pans. Bake at 400F for 20-25 min.